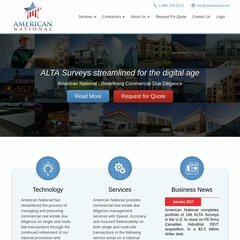 Topics: Services, Alta/acsm Land Title Surveys, Boundary Surveys, Multi-site Portfolio Transactions, Standards, and Topographic Surveys. Age: It went live on June 15th 2003, making it over 14 years, 10 months old. It is hosted by Theplanet.com Internet Services Inc (Texas, Houston,) using Apache web server. Its 5 DNS Records include, ns3.mydyndns.org, ns2.mydyndns.org, and ns1.mydyndns.org. PHP/5.2.17 is its coding language environment. PING (174.120.107.11) 56(84) bytes of data.